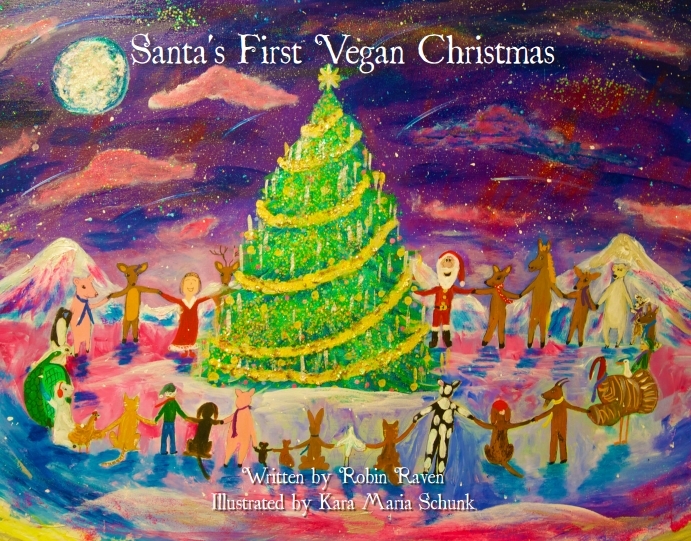 When I read the title Santa’s First Vegan Christmas, I thought that this was going to be a kids’ book about leaving Santa plant milk and vegan cookies under the tree. Boy was I wrong! This cute, rhyming kid’s story actually tackles the very serious theme of animal labor. Specifically, it deals with the fact that Santa is using reindeer to pull his sleigh. Luckily, a sweet little reindeer named Dana sets Santa straight. Realizing the errors of his ways, Santa decides to run his sleigh on magic power. Once he gets into the vegan spirit, he even decides to liberate all the caged pets and animals that Christmas too. I’ve got to admit that I was worried this theme would be too intense for my 5-year old. Would it ruin Christmas for her if she started thinking of Santa’s reindeer as indentured servants instead of jolly volunteers? I’m happy to say that the book did not ruin Christmas for my daughter, and we did have a nice discussion about whether it is fair to use animals like horses and reindeer for pulling sleighs and carriages. What will she think the next time we hear the song “Rudolph the Red Nose Reindeer” playing? I’m not sure. But this book definitely highlights how our vegan values can often conflict with holiday traditions. The book is a fun, lighthearted way to introduce a really serious topic with your kids. Aside from the intense underlying message, Santa’s First Vegan Christmas is a cute holiday story with rhymes that flow very well and quirky illustrations. I’ll definitely be reading it with my kid again when the holidays come around. I love the sound of this book! There are so few vegan-friendly Christmas books. How exciting we now have one that’s explicitly pro-vegan, pro-animal rights!